This was the first vacation I ever recorded. It was 1998, I was 14, and I was on an Alaskan cruise with my Mom, Dad and sister. I shot a lot of great footage on that trip, but some of the best was from the afternoon that we spent on the White Pass & Yukon Railway. The trip took us from Skagway, Alaska through the northern tip of BC and into the Yukon territory. It was the definition of a scenic ride. 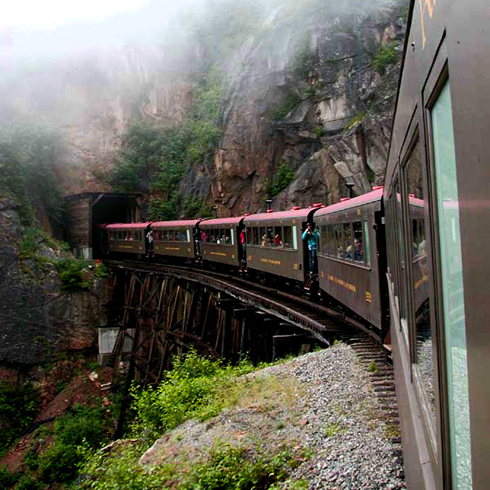 What makes the White Pass so incredible is that the rails are literally on the edge of mountains, which in turn allows for some incredible views and maybe a bit of vertigo too. It was used back in the gold rush to transport workers and miners, but now, and for obvious reasons, it has a lot of tourist appeal. I don't think any video could ever really capture what the experience and views are actually like, but it's certainly fun to try. When ever I see environments like so I can't help but think of the pioneers. Can you imagine what it would be like to be the first to explore some land having no expectations. Traveling across the shield until you see a breathe of air at Manitoba. The smooth sailing is welcome until you hit Alberta and you see these things off in the distance and your like what the hell is that. Then when your in the rockies you realize it is worse than the shield and you have no where to go but north to colder hasher territory. Yet you continue in order to find something but you have no idea what that is. Its crazy and a pretty good metaphor for film school. Ironically some of the first great film works were much like yours here, the train was a symbol of the era and used in so many early films that 'laid the tracks' for the future. Its like an homage to exploring pioneers and film pioneers and anyone can experience it first hand. Very nice comment M! What gets me is that the weather that far north (southern Alaska/Yukon) is generally cool at best, and to picture the guys who actually built this railroad, and made these tunnels back in the 1890s is difficult to comprehend considering the terrain. I've heard that the White Pass has been called a construction wonder of the world because of how challenging it was to build.